Located in the Western Lake District, which is only an hours drive from the M6, the area has many local attractions as well as being a walker s paradise. To the east is the spectacular scenery of the Lake District, while to the west , the Cumbrian coast offers long, uncrowded beaches. Indeed the area offers the best of both worlds; it is attractive but remains unknown by the majority of the Lake District tourists. For those contemplating an energetic holiday, nearby Eskdale and Wasdale offers fell walking and mountaineering suitable for all levels of experience. To the south, the famous Ravenglass and Eskdale Narrow Gauge Railway takes the visitor through the spectacular scenery, whilst nearby Muncaster Castle is an impressive ancestral home with beautiful gardens, and an owl centre . The Stanley Arms Hotel is just a few minutes away from Sellafield, making it an ideal stop over for visitors to Sellafield, Drigg or Thorp Sites. The Stanley Arms Hotel has 12 ensuite bedrooms, which include Single, Twins, Doubles and Family Rooms. 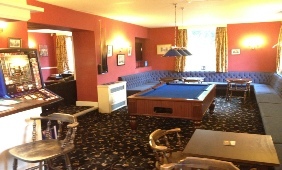 The rooms all have TV's and Tea and Coffee making facilities. Enjoy a drink in a friendly bar. There is a door leading in to the garden from here. Superb beer garden situated right next to the river Calder. The hotel holds the fishing rights to this popular river. 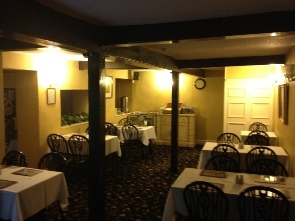 The Stanley Arms Hotel Restaurant comfortably seats 32 persons. We seek to provide the best in cuisine at a reasonable price. Meals are prepared individually using fresh local meat and produce where possible. To accompany your meal's we offer a range of carefully selected wines and other drinks are available from our bar. We also cater for business lunches, parties, meetings and groups. Our menu has a wide selection of dishes. Food is served daily between the hours of 12 noon and 8.00pm.